Entering into their 15th season performing throughout South Florida and on national tours, Seraphic Fire is regarded as one of the preeminent professional vocal ensembles in the United States. Led by Founder and Artistic Director Patrick Dupré Quigley, Seraphic Fire brings top ensemble singers and instrumentalists from around the country to perform repertoire ranging from Gregorian chant and Baroque masterpieces, to Mahler and newly commissioned works by this country’s leading composers. 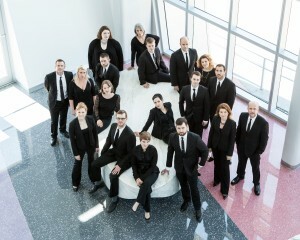 Two of the ensemble’s recordings, Brahms: Ein Deutsches Requiem and A Seraphic Fire Christmas, were nominated for 2012 GRAMMY® awards, making Seraphic Fire the only choral ensemble in North or South America to be nominated that year, and the only classical ensemble in the world to be nominated for two separate projects. During its 15th Anniversary, Seraphic Fire puts South Florida at the center of artistic innovation with eight new world-premiere choral works by established and emerging American composers. The season also features appearances with The Cleveland Orchestra, collaborations with GRAMMY®-winning organist Nathan Laube and violinist Matthew Albert, and a guest appearance by conductor Elena Sharkova. Recognized as “one of the best excuses for living in Miami” (el Nuevo Herald) because of its “vivid, sensitive performances” (The Washington Post), Seraphic Fire’s artistic accomplishments have translated to chart-topping album sales. The ensemble’s September 2014 release, Reincarnations: A Century of American Choral Music, soared to No. 6 on the Billboard Traditional Classical Chart and the ensemble’s GRAMMY®-nominated recording of Brahms: Ein Deutsches Requiem debuted at No. 7 on the Billboard Traditional Classical Chart.